After beginning her time at Arizona State University on a journey cycling from Flagstaff to Tempe, it was only fitting that Mia Armstrong would graduate to go on another adventure. Armstrong has won the prestigious honor of accompanying New York Times Pulitzer Prize-winning columnist Nicholas Kristof on a reporting trip this year to cover global poverty and social justice issues. The double major in journalism at the Walter Cronkite School of Journalism and Mass Communication and global studies with the School of Politics and Global Studies won a New York Times contest for an essay critiquing the media’s coverage of the criminal justice system. Established in 2006, Kristof’s Win a Trip Contest encourages university students to submit an essay on one of three topics: disagree with a column by Kristof and explain why; disagree with the Times’ coverage of a topic and explain why; or choose an issue that is poorly covered and explain how it could be covered better. In Armstrong's essay, she argued that media reports of people who are incarcerated often lack a human element. Armstrong was speechless when Kristof himself called to inform her she had won. Armstrong, who will graduate in May, has worked in Arizona prisons for the past two years teaching a course on writing and journalism. She said the experience gave her a personal look at the ins and outs of the criminal justice system. She said she has long admired Kristof’s columns and thinks the trip will be a great opportunity to learn from a journalist who is covering the issues that are important to her. ASU senior Mia Armstrong hopes to live abroad and do bilingual reporting after graduation. She is pictured here while studying in Mexico City. During her freshman year, Armstrong took a class with School of Politics and Global Studies associate professor Victor Peskin on humanitarian crisis and international intervention. The course required students to read “Love Thy Neighbor” by Peter Maass about his time covering the conflict in the Balkans as a journalist with the Washington Post. After that class, Armstrong signed up to add a journalism degree. As part of her trip with Kristof, Armstrong will write pieces for The New York Times’ website. She will be reporting from either Guatemala, Haiti or American Indian reservations. A location has not yet been chosen. In addition to her work with Arizona inmates, Armstrong is a bilingual journalist for Cronkite Noticias, an immersive professional experience in which Cronkite students report on issues critical to the Latino community. She previously interned at Future Tense, a partnership between Slate magazine, New America and ASU that explores emerging technologies. After Kristof publicly announced her as the winner of his contest, Armstrong shared that total strangers had reached out with their support. Even ASU President Michael Crow shared his congratulations. “That’s been a really amazing experience — feeling support from people I don’t even know." Following the trip, Armstrong said she hopes to continue her journalism career, reporting on issues related to borders and immigration. At The New York Times, Kristof has won two Pulitzer Prizes for his coverage of Tiananmen Square in China and genocide in the Darfur region of Sudan. His reporting covers human rights, women’s rights, health and global affairs. He and his wife, Sheryl WuDunn, have written several books together, most recently “A Path Appears” about how to make a difference. His next book is expected to be released this fall. The Center for Global Development assisted Kristof in picking a winner for the contest. The CGD is an organization that works to reduce global poverty and improve lives through innovative economic research that drives better policy and practice by the world’s top decision makers. Although Armstrong is ready for the next chapter, the idea of graduating this May from ASU doesn’t seem real yet. Matt Oxford and Joe Giordano contributed to this report. 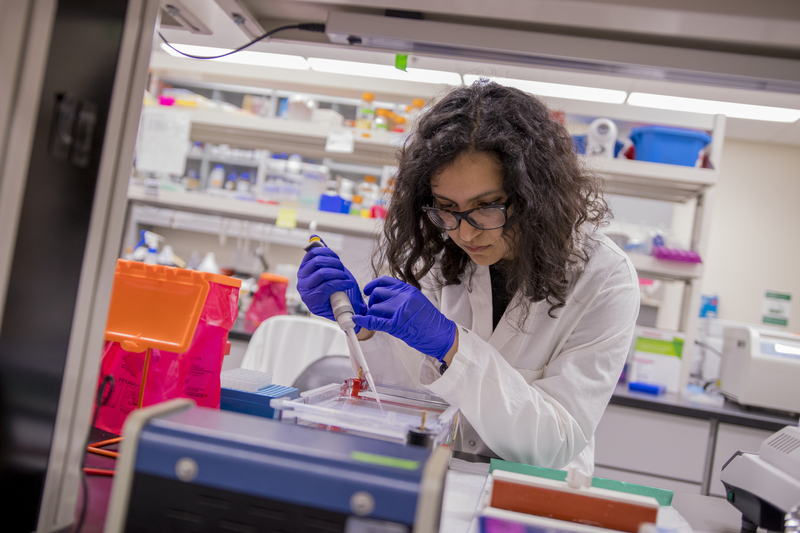 “In the future, I want to help others overcome their own struggles,” said Karanjia, now a junior double-majoring in chemical engineering in Arizona State University’s Ira A. Fulton Schools of Engineering and molecular biosciences and biotechnology in ASU’s School of Life Sciences. “Other schools said research was for upper-division students, and I wanted to get involved as soon as I started college,” Karanjia said. After she was accepted at ASU, Karanjia was invited to join ASU’s Grand Challenge Scholars Program — a National Academy of Engineering-accredited program that helps prepare students to be collaborative, cross-disciplinary problem solvers. Grand Challenge Scholars Program students pursue entrepreneurial, global and service learning opportunities to find solutions to 14 grand challenges society faces in the 21st century, including engineering better medicines. Amy Trowbridge, a senior lecturer and director of the Grand Challenge Scholars Program at ASU, believes having a double major is a unique way Karanjia has embraced the program’s principles. “Ava embodies the characteristics of a Grand Challenge Scholar in that she is gaining and applying knowledge from two different disciplines to solve multidisciplinary challenges related to health,” Trowbridge said. “In Dr. Bean’s group, I’m acquiring all these new skills and really pushing myself toward something new,” Karanjia said. The results of Karanjia’s research with Bean can help patients with cystic fibrosis and even astronauts who are at risk for lung infections. Consequently, the ASU NASA Space Grant Program has supported their research. Ava Karanjia poses with her first-place award for the undergraduate collegiate technical poster competition at the Society of Women Engineers Conference. At the American Institute of Chemical Engineers Annual Student Conference, Ava Karanjia holds her first-place award for the student poster competition. Ava Karanjia (bottom row, fourth from left) poses with other student counselors at the E2 welcome event for incoming first-year Fulton Schools students. Ava Karanjia (third from left) poses with other Tooker House residential hall peer mentors. In this role she helps first-year students be successful and discover opportunities to explore their interests. Karanjia’s primary goal was to measure the amounts of secreted virulence factors, the bacteria’s attack arsenal, in early and late stages of infection, and to identify the underlying genetic changes. She plans to continue this research to better understand how these chronic infection adaptation affect the populations of P. aeruginosa that reside in cystic fibrosis lungs. The work will help researchers better understand how infections progress and, in turn, will better inform treatment options. In two consecutive weekends of her junior year, Karanjia presented her multidisciplinary research in the poster presentation competitions at the Society of Women Engineers WE 2018 Conference and the American Institute of Chemical Engineers Annual Student Conference. Karanjia won first-place prizes in both competitions, outperforming 20 research finalists at the Society of Women Engineers conference and more than 300 undergraduate chemical engineering students at the American Institute of Chemical Engineers conference. “With the caliber of students there and the amazing research presented from so many different excelling universities, I think I did pretty OK!” Karanjia said. Earning both the Society of Women Engineers and American Institute of Chemical Engineers first-place awards is a special accomplishment. “The fact that she has won two awards for her research posters at two different conferences in the same year is a tremendous accomplishment that definitely makes Ava unique, and we are proud that she is part of GCSPGrand Challenge Scholars Program,” Trowbridge said. “I personally had really great mentors who helped me narrow down on my passion and research topics, so I wanted to be that resource for other people,” Karanjia said. Karanjia has led K–12 outreach efforts with Fulton Ambassadors, a group that shows prospective students around the Fulton Schools and gives classroom presentations. “Your undergrad education is meant for you to collect experiences, different perspectives and viewpoints of the world around you,” Karanjia said. “Helping others to realize their passions and successes is something that has made my undergrad experience more valuable,” Karanjia said.